It is a story which exposes South Africa’s structural weaknesses too. Poverty, inequality and unemployment lie at the heart of the shootings this week. The Lonmin story starts with the 360,000-member National Union of Mineworkers, formed in the 1980s to fight apartheid labour laws. Under the leadership of Cyril Ramaphosa – ironically now on the board of Lonmin – the union became the biggest affiliate to the Congress of SA Trade Unions (Cosatu), a powerful ally of the ruling ANC. For more than a decade Cosatu has concentrated on socio-economic and political issues. Instead of organising on the shop floor it has harried the ANC government to adopt increasingly left-leaning policies. The NUM, one of the two biggest unions within Cosatu, has been at the forefront of these struggles. Over the past few years the NUM has been split by succession battles inside the ANC, with the current leadership campaigning for ANC President Jacob Zuma to win a second term. The union has paid a heavy price for this. 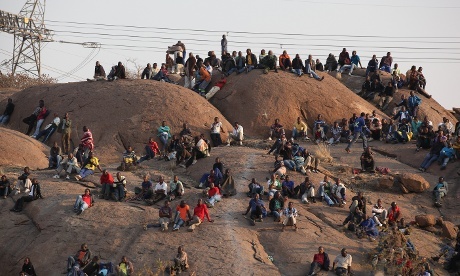 At the Lonmin mines its membership has declined from 66% of workers to 49% and it has lost its organisational rights. Disgruntled and expelled union leaders had in the meantime started a new union, the Association of Mineworkers and Construction Union, and were organising on the NUM’s turf. The AMCU dangled a fat piece of fruit in front of the workers’ eyes: rock drillers (who are the core of this strike and do the hardest work underground) earning R 4,000 a month were promised R 12,500 a month. The union’s support in the Lonmin mines shot up to 19% by last month, and it embarked on an illegal strike to force its pay demand. This week the strike turned violent. On the ground, armed workers are promising to “take a bullet with my fellow workers”. The AMCU’s leaders are preparing for war. The NUM has lost all credibility and is bleeding members. Its already well-paid secretary, Baleni, was awarded a salary increase of more than 40% last year. NUM leaders have refused to get out of police armoured vehicles to address workers. Last year one of them was struck with a brick and lost an eye. They have no cogent plan to end the strike. The police, too, have lost credibility. Although the indications are that they were shot at, a death count of 34 in three minutes suggests panic. A judicial inquiry is likely. Lonmin saw its chief executive hospitalised with a serious illness two days ago. It is leaderless, then, and has no coherent plan to end the impasse. On Friday, it kept a stony silence after days of hapless statements.